Kritika Rathi did her schooling from Mayo College Girls School, Ajmer after which she attained an Economic Hons Degree from Lady Sri Ram College, New Delhi. She thereafter, completed a Masters in Fashion Management from NIFT, New Delhi. After which she attended the London College of Fashion to improve on her design skills. She works as the Content Head & Senior Editor at Shaadiwish. Content Writing is the creation of the content that is visible on a website or other social media platforms. This content could include words, captions, product descriptions as well as pictures. "I did my schooling from Mayo College Girls School, Ajmer after which I attained an Economic Hons Degree from Lady Sri Ram College, New Delhi. I thereafter, completed a Masters in Fashion Management from NIFT, New Delhi. After which I attended the London College of Fashion to improve on my design skills. 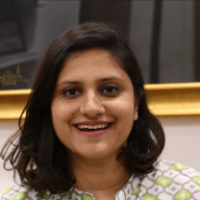 I work as the Content Head & Senior Editor at Shaadiwish."